Brayman Construction successfully completed another Hydroelectric Dam project in North Carolina last week. The project team successfully completed this two-month long project incident-free and without injury, continuing our commitment to Safety at every level of the organization. 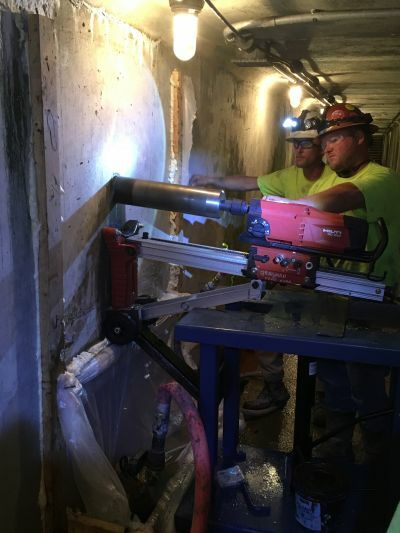 For this project, Brayman performed the drilling of 10 uplift relief drains at the hydroelectric dam. NQ sized holes were cored vertically from the spillway bridge 119LF to the inspection gallery elevation. The vertical holes were located from within the gallery, and were then intercepted with a 4” diameter horizontal hole drilled with a specially modified drill. Vertical Drill Holes were located from within the gallery using 3D survey tools. These holes were accurately located through a 6’ thick concrete wall which contained rebar and embedded utilities. In effect, Brayman intersected two each, 4” holes inside of the dam. This successful innovative solution proposed and put into action by Brayman provided results that are essentially like hitting a needle in a haystack. To the entire project team, congratulations for a job well done and thank you for your continued commitment to making “Safety our Attitude for Life”! Get news updates from Brayman Construction sent straight to your inbox. © 2019 Copyright Brayman Construction. All rights reserved. Website by Flying Cork.